Internet business scams are sneaky, nasty, expensive and fraud. Everybody Hates Internet Business Scams! I just googled internet business scams. What an eye-opener! You have to love it when the websites devoted to busting online scams look like scammy websites, complete with squeeze (high-pressure, suscribe NOW) pages! Oh, and here's a guy that wants to sell you an ebook about internet business scams. For a small price, you can buy his ebook. My nerves! I didn't realize the big money you can make exposing internet scams. Damon Runyon wrote a story called “The Lacework Kid.” The main character was a card shark; a professional card player that preyed on tourists on passenger ships. He was called the “ lacework kid” because he had such skilled hands with the cards. He always sat beneath the sign that said “no card sharks allowed” to show that they can't be talking about him. Internet business scams are fraud, plain and simple. They cost people valuable time and money. Usually those that can least afford to waste either! 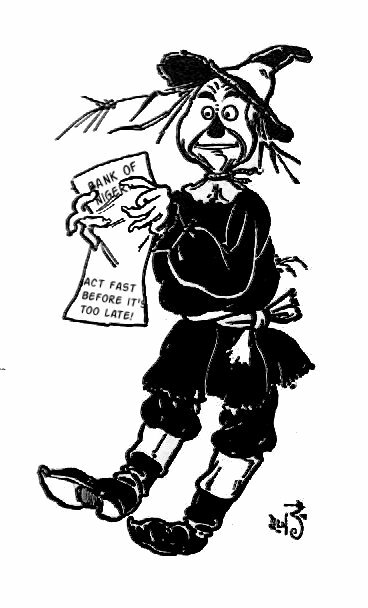 Of course, scams and get rich schemes are nothing new. 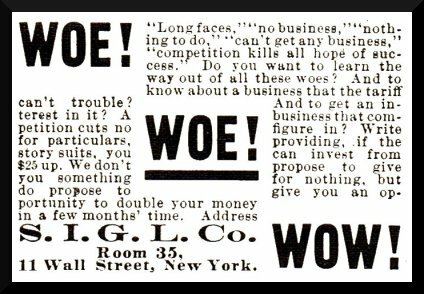 I have old magazines from the 1880s, and there were “work at home and make easy money” ads in those too! The lure of easy money is very attractive... always has been and always will be! The "woe to wow!" ad is from the back of a woman's needlework magazine from 1894! It promises easy money if someone had $25.00 to invest... a lot of money back then! Scammers usually target elderly or physically challenged people (there's some serious bad karma for scammers) and unemployed people or under-educated folks, (notice how ads are targeted for those people on daytime or late night TV.) Stay-home moms are another target because they usually need some extra money for the family. The current recession has made people even more vulnerable to scammers because they're more desperate. Most people want to believe they can get something for nothing. How do you recognize an internet business scam? If it looks like a duck... walks like a duck... quacks like a duck... its a DUCK! All businesses are built with your hard work, your knowledge, and require you to be accountable or responsible in some way to the customer. This is true on or off the internet. If the only thing you're required to add to a business opportunity is money and a little work, you're probably looking at a scam. Internet business scams prey on both the needy and the greedy. They are fueled by your hope, optimism and of course, your money! Your big payoff-- a reality check. Yep, ya was suckered! I guess that sure money wasn't such a sure thing after all. Here's some common kinds of internet business scams to watch out for. Craft assembly scams. Make stuff from the comfort of your own home and sell them back to the scammer. The only people making $$ are the scammers that sell you their kit. The catch is that the finished product is always defective. You're left without the money you invested, stuck with “defective” product. Yippee. Envelope stuffing. Tho not technically an internet only scam, I'm including it here cause it's so common. The scamee pays for envelopes & addresses. The catch is that you're soliciting other envelope stuffers to pay you. Either ponzi or a pyramid scheme, it's as illegal as heck! Don't even consider this one. MLM or network marketing. Scam or opportunity? Beauty is in the eye of the beholder. You can make money network marketing IF you find a legitimate MLM, and IF you're the right personality type to make it work. More about this later. Medical billing. Do you really think that the industry lets just anybody handle sensitive records like this? Hmm. To get into this one, you pay up-front for leads (which you could get yourself from the local phone book. Don't count on paying your medical bills or car payment witht his kind of internet business. Email processing. You, of course, pay a fee. Notice a trend here? It basicly gives you places to post spamming ads. Dead end. Chain mail or email letters. This is a good old-fashioned classic pyramid scheme. You send money to the guys on the top of the pyramid. Don't even get caught! I wouldn't count on ignorance being an excuse if you end up in court. Typing. Similar to the chain mail and envelope stuffing schemes. But you get to spend time typing too! There's an up-front cost for software & and a list to mail to. Pyramid scheme. Surveys online. Pay a fee to join a members club. Fill out marketing surveys. Make a little money. Honestly, I don't know much about these newest internet business scams. Most of the sites that “expose” these are really promoting. I'm too busy to try to make money with surveys. I'd consider it a scam until I see otherwise. You can't be too careful online. This is a good place to remind you to watch out who you give your email address to. The bad guys don't usually look like bad guys! Maybe you're wondering where the scammers are getting all of their lists? Well, that innocent survey you did that asked for your email address? Guess what... you've been placed on somebody's list of lists. Wonderful. The best thing to remember is simply this... if it seems too good to be true, it probably is not true. Apply this to both business opportunities and internet business scams, and you'll be harder to fool.